There are countless varieties of Orchid across the world and we are fortunate in the UK that we have around 50 odd species here. They vary from tiny example a few centimetres high to magnificent flower spikes that can reach much higher than the surrounding vegetation. They vary hugely, some are strongly perfumed, some smell rank and others are scented to attract a particular type of insect. The flowers are the thing that makes the orchid unique though, spectacular petals, mimicry of insects and gorgeous colours. They truly are a plant that are is rewarding to find and they seem to attract obsessive types (mostly men) who are utterly besotted with these beguiling plants. Jon Dunn is one of these who considers himself an addict. To satisfy this addiction he decides to take himself on a mission to see all the species in the UK. This will take him from the Dorset coast, over the South Downs, up into Scotland and to the wild coastline of Western Ireland and back home to the very Northern Isles of our country. However, there is to this than the obsession of one man travelling backwards and forwards across the country in search of them. Some of these are really common, anyone with a small amount of research can find hundreds in the right location. Others though are much rarer, locations are often secret and frequently protected from those that seek to have these for themselves. As he ticks them off the list he tells the stories behind each one of these elusive and beautiful plants. 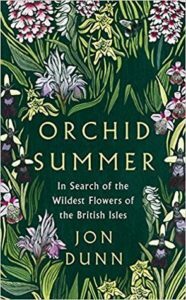 It is an enjoyable book about one slightly obsessed man’s quest to see and photograph every species of orchid in the UK and a brief sojourn to New York. It reminded me of The Orchid Hunter where Leif Bersweden undertakes a very similar pilgrimage to find the same plants. 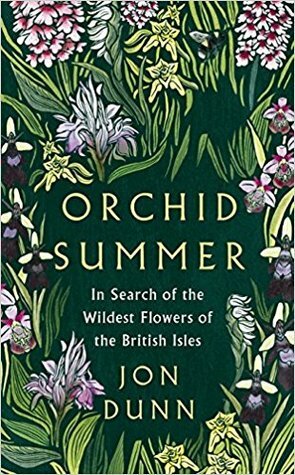 One to read if you have a general interest in plants and botany, and has a stunning cover. If there is one thing that lets the book down is that there are no photos. Thankfully they are available on Jon’s website here, and they are a stunning set of images.